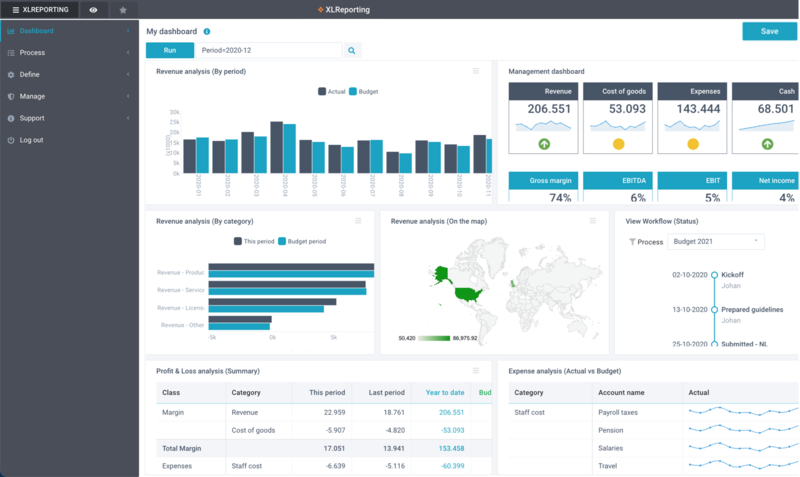 A dashboard is a personal page with your own favorite reports and models. Every user has his or her own personal dashboards. You can organize your dashboards in a way that makes the most sense to you. For example: you can create a dashboard for sales reports, a dashboard for financial reports, a dashboard with your KPI models etc. Each report or model is shown inside a widget: a small frame that you can drag and move, and change its position, width, and height on the dashboard page. Click on Actions - Create new of an existing dashboard. Click on Actions - Add to dashboard when you run a report or model. Either way, the rest of the process is the same, and you can enter a name for your new dashboard and add the first report or model. You can also easily copy a dashboard. You can add, move, or remove items on your dashboard at any later point in time. grab the ☰ icon to drag and drop the widget around on your dashboard page. The display sizes are relative sizes. It indicates the relative proportions that widgets can occupy on the same row. 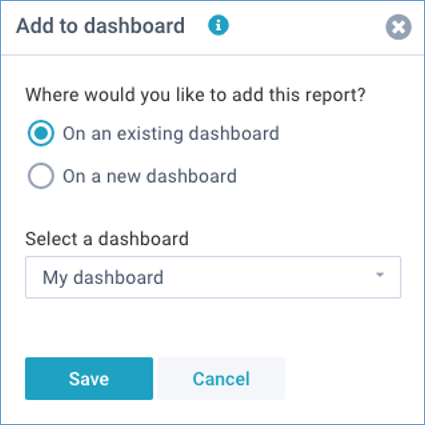 If you remove a report from your dashboard, you are not deleting the report (or model) itself, you are only removing it from this particular dashboard. Dashboard pages are complex web pages. If you want to export them to PDF, select Actions - Export PDF or print and then choose Print to PDF or Open PDF preview in the print dialog window of your browser. If you delete a dashboard, you are not deleting any of its reports or models, you are only deleting the dashboard itself. Publish to user roles - select one or more existing user roles in XLReporting. All users that have been assigned these role(s) will see your dashboard in "view-only" mode whenever they are logged in. Anytime you change your dashboard, or when the report data changes, these changes are immediately reflected to these other users. The users can also opt to create their own personal copy of your published dashboard, which they can subsequently change to their own liking. Publish to users - select one or more existing users in XLReporting. They will see your dashboard in "view-only" mode whenever they are logged in. Anytime you change your dashboard, or when the report data changes, these changes are immediately reflected to these other users. The users can also opt to create their own personal copy of your published dashboard, which they can subsequently change to their own liking. Publish to external people - enter one or more email addresses (each email address on a separate line). An individual email will be sent out to every recipient with a unique and personal link to the published dashboard. These recipients do not have to be registered XLReporting users, they don't have to install any software, and they are not required to login to XLReporting. They can see the dashboard by simply clicking on the link. Anytime you change your dashboard, or when the report data changes, these changes are immediately reflected to these other users. This is strictly "view-only", and these users will never get access to any other functions within XLReporting. Whenever these users view a dashboard, this will be logged under your user activity, so you can monitor when and by whom your dashboard is being viewed. You can revoke users at any time by removing their names from the published list. 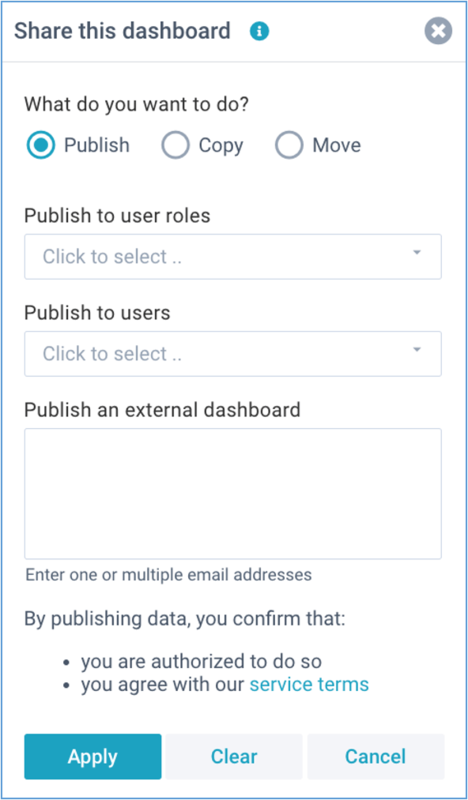 The option to publish dashboards can be enabled or disabled in user roles. The option to publish dashboards to external people can be disabled for your tenant via My account - Profile - Disable published dashboards. A dashboard page consists of one or more widgets. These widgets combine into a so-called "grid" consisting of any variable number of rows and columns. When you drag and move widgets, you're moving them to another location in this grid. Dashboard pages can scroll both horizontally and vertically if needed to properly show the widgets. Edit - Move to own row - by moving a widget to its row, it can use the full width of the screen. Actions - Rebuild layout - this rebuilds the entire layout the dashboard. You can choose how many widgets you want on each row, and the dashboard page will be rebuilt accordingly.